Record-smashing August means long-awaited ‘jump’ in global warming is here | "Global Possibilities"
Every month of 2016 has set a temperature record. We appear to be in the midst of the long-awaited jump in global temperatures. And that means “The kinds of extreme weather we have seen over the past year or so will be routine all too soon, but then even worse records will be set,” as Kevin Trenberth, one of the world’s leading climatologists, told me. 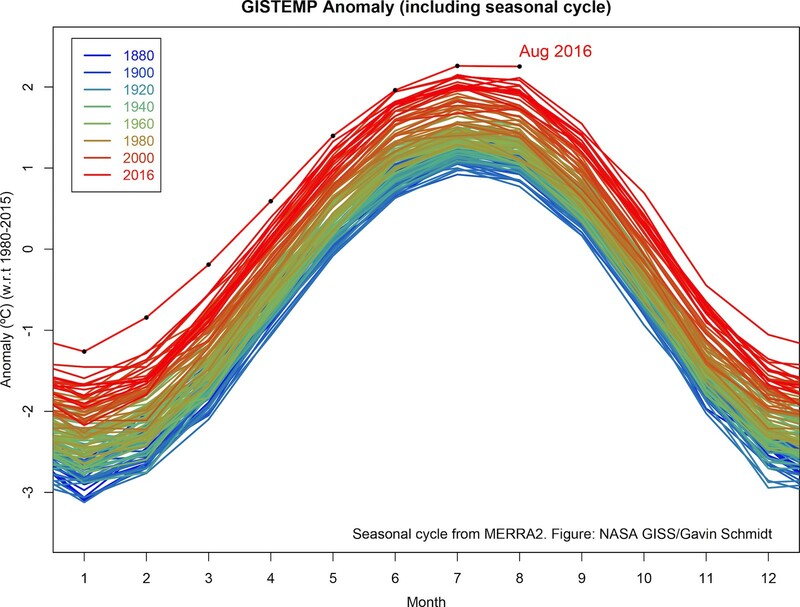 NASA has reported that last month was not merely “the warmest August in 136 years of modern record-keeping,” it tied with this July 2016 for the “warmest month ever recorded.” And for 11 straight months (starting October 2015), the world has set a new monthly record for high temperature. A March 2015 study, “Near-term acceleration in the rate of temperature change,” makes clear that an actual acceleration in the rate of global warming is imminent — with Arctic warming rising a stunning 1°F per decade by the 2020s. Well, we are indeed at the end of an El Niño event, and we have indeed seen a big global temperature increase. In April 2015, Trenberth told me thought “a jump is imminent.” Previously he had explained that this jump could be 0.2°C or 0.3°C, which is to say up to 0.5°F! That change would happen “relatively abruptly,” but last for 5 or 10 years before it jumped again. That’s where we are. 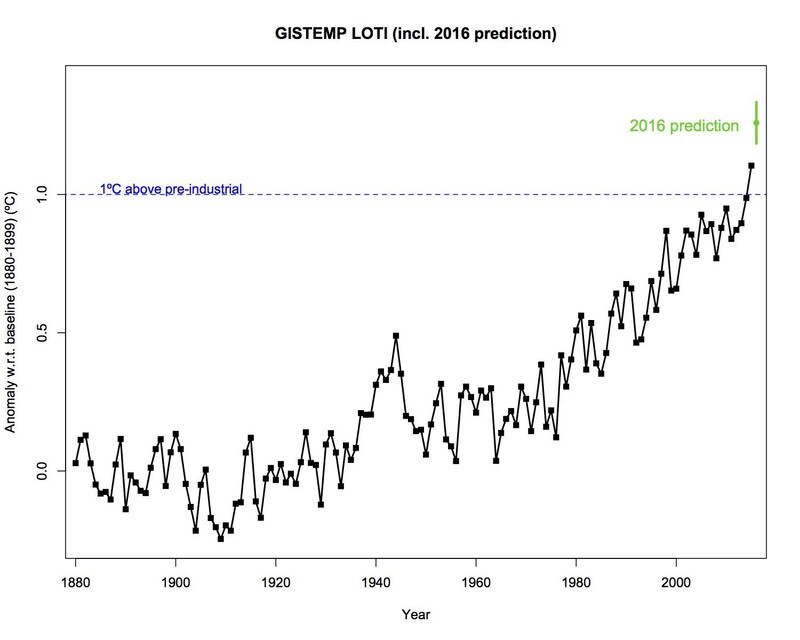 Global temperatures often jump over a couple years, then they rise more slowly, like a staircase (or ladder) where the steps are sloped up. The climate science deniers make a lot of noise during the short periods of slower warming, and stay strangely quiet during the jumps. Go figure! It is time to slash carbon pollution so we can stop climbing this stairway of ever-worsening extreme weather and climate change.